I've had the honor of meeting your daughters. They miss you so much. You would be proud of them. I hope you know you will never be forgotten and that you live on in and through them. Chief Boykin our sacrifice will never be forgotten! Thank you for your dedicated service to The City of Enterprise and the citizens you were sworn to protect! Continue to rest in peace my fellow LE brother! Your sacrifice will never be forgotten! Thank you for your dedicated service to your community! Continue to Rest in Peace Cheif Boykin. Missing you really bad big brother. Hard to even look at your picture without falling apart. A part of me went with you that I'll never get back. You'll always be my hero. I always looked up to you and was so proud of you. Love you always. Missing you my brother. It's hard to stop the tears from flowing when I look at your picture. I always looked up to you. You'll always be my hero man. I love you, bro. Please pray that we can find peace and Justice. God Bless you Chief Boykin. May the good Lord above cradle you in His arms, and may you Rest in Peace my Brother in Blue. I offer my prayers and sympathies to each and every one of your family members, friends, and co-workers. Rest easy Sir. My deepest condolences to the family, members of the department, and those served, at the loss of this leader. May faith, family, friends and time join together to ease everyone’s pain at this time of loss. On behalf of my family, I extend our sincerest condolences on the grievous loss you suffered when Chief Boykin. To Chief Boykin's family, my heart goes out to all of you and may you find comfort in your loved ones and your strength in your faith. When my son was killed, the entire law enforcement community in our area embraced us in a circle of love and support, and I know you will receive the same support. It makes the unbearable less torturous, and I pray for your solace. This reflection is sent with the utmost respect for the dedicated service Chief Boykin gave to his community and the citizens of Mississippi, and for the supreme sacrifice he and his family made on March 19, 2013. We are truly sorry to hear about the loss of Chief Boykin. Our hearts are with your department and Chief Boykin's family. Thank you for your service. The National Police Wives Association would like to extend their heartfelt prayers to the family of Police Chief Randy Boykin and the Enterprise Police Department during this time. Thank you, Chief Boykin, for your service. Though I never knew him, he was part of my Law Enforcement family and I will mourn this deep loss the rest of my life. My heart aches with all the losses we have suffered, and continue to suffer, through the years. God is our only peace through such times. May family & friends feel the presence of the "God of All Comfort" as they endure the distressing days ahead. I join them in their agonizing grief & remember them in my prayers. Daddy, I miss you more than words can express. I can't understand why this had to happen. I wish God would have given another 5, 10, 20 + more years. I hate that my sweet Robin will never know her Papaw. I love you always! I am sorry to hear for the loss to your family Chief, the loss to your department, and the entire town. Enterprise, Mississippi is my home away from home. I'm hundreds of miles away but my heart is very near to Enterprise. We got the watch now Chief. Your work is done here on Earth - Heaven has called upon you today, leaving so many words left to say. But now it's too late, for your time has come, words unspoken; I am sure everybody has some. Regrets and wishes are probably there too, but lasting forever are memories of you. There have been many times that we waved to each other, but we were there for each other in time of need. Now it's time for us to say Good-Bye, until we meet again in heaven to fly. Now go and Patrol the Heavens Above and Watch Below those you Love. Thank you for your service. Rest In Peace Chief Boykins. 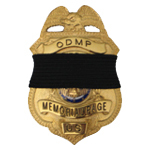 Our deepest heartfelt condolences to all of your family, friends, and brothers and sisters at Enterprise Police Department. RIP my Fellow Brother in Blue. My prayers go to the family, friends, and co-workers. May you rest in peace and may God bless you for serving the community so faithfully.